Section 1:Emergent or Brief Duration Work – When Is Traffic Control Required? Emergent or Brief Duration Work – When Is Traffic Control Required? Roadside work is dangerous. Moving traffic poses an enormous risk to roadside workers as well as to the travelling public. The best way to protect yourself when traffic could be hazardous is to build an effective traffic control zone to separate your work area from passing traffic. For emergent work (requiring less than five minutes such as a vehicle needing a jump start or fuel) or brief duration work (requiring less than 15 minutes such as a stalled vehicle), you need to assess the risk to determine if traffic control measures are needed in order to reduce the risk of injury. 1. Work Duration: Will the work take longer than 15 minutes? 2. Sight Distance (distance from parked location to the furthest point that can be seen on the road): For the posted speed limit, is the minimum sight distance less than indicated? 3. Traffic Volume: Is the estimated traffic volume in the lane(s) you’ll be entering more than four vehicles per lane per minute? 4. 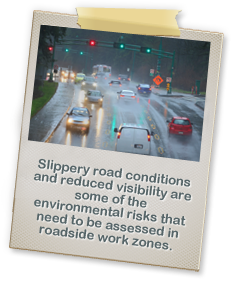 Environmental Conditions: Is visibility restricted (fog, heavy rain, blowing snow, etc.) and/or are road conditions slippery? If answers to all four questions are No, no traffic control measures are required. If answers to one or two questions are Yes, a traffic control measure is required. If answers to three or four questions are Yes, additional traffic control measures are required. Traffic control measures include techniques and devices such as cones, signs, barriers, traffic control persons (TCPs) to manage the flow of traffic. 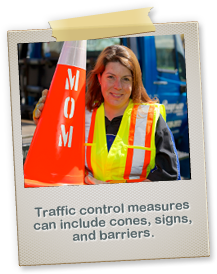 Ensure you have the correct traffic control devices (TCDs) for the required work zone layout, as specified in the 2015 Interim Traffic Management Manual for Work on Roadways (Traffic Manual). Proceed to set up your work zone, following the layout specified in the Traffic Manual. Inform your supervisor if you do not have the correct equipment or are unsure of the required layout. Inform your supervisor if a TCP is required. E.g. available TCDs do not meet the minimum requirements per the Traffic Manual or if single lane alternating traffic is required. Delay work until the appropriate TCDs are positioned and any other required measures are in place. Follow the requirements of section 18.17 of the Occupational Health and Safety Regulation. See the Automotive Retailers Association (ARA) for additional risk assessment and health and safety information. 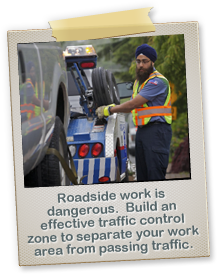 For more information on roadside worker safety, visit ConeZoneBC.com.